Kara Nelson is the Juneau Police Department’s December 2016, Re-Entry Hero and wraps up our Re-Entry Hero series. Nelson has not only overcome her own addiction and family wreckage that came with it but has now dedicated her life to lifting up people in addiction and supporting them in finding long-term recovery. It’s not an easy calling. Over the last few weeks, Nelson has been working to get five different Juneau residents, who are addicted to substances, into treatment. It wasn’t going well. Suddenly, four of them were able to get into treatment in and outside of Juneau. There was no logical reason for that to have happened and Nelson credits divine intervention more than her relentless pursuit of treatment openings. coming out of prison without even being on probation to help hold her accountable. She knew the pull to use was going to be very strong. Nelson raised the money to get her an assessment in jail, met the woman when she was released, but still lost her to the streets and drugs before a treatment opening could be found. Nelson is an emergency responder who works day and night without compensation even on Christmas, especially on Christmas as it turns out, trying to help people with addictions. Like a lot of emergency responders, Nelson is tormented most by those she can’t help and wants to recruit more people like her to combat addiction. Nelson has spent the last three years pursuing grants and partnerships so that Juneau can have more people like herself, people with who have experienced addiction and incarceration, to coach people wanting to recover. Nelson is encouraged by how in the last couple of years she has seen an increasing number of people willing to see former prisoners as people rather than individuals that are anywhere from disposable to frightening. When she first started lobbying for access to drugs that can counteract an overdose, people would say that those people overdosing should be allowed to die as a consequence of making bad decisions. Nelson knew the lives being disregarded so casually included her former self, as she had overdosed several times and just happened to survive. Nelson spent many years of her life knowing society viewed her as worthless. She echoed that assessment of herself endlessly in her own mind as she sat in jail, watching other men and women do the same. The natural temptation was to put up a wall and to be angry and resentful, withdrawing from society in a mutual rejection. Nelson, eventually, made the decision to accept all that negativity and rely on her faith to give her the strength to prove herself and to then use that earned respect to advocate for others. Nelson has found allies for her mission she originally did not expect. 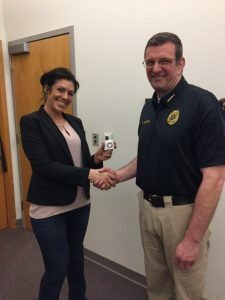 Nelson credits the Alaska Department of Corrections (DOC) with having probation officers, administrators, and corrections officers, especially in Juneau and at the state level, who are genuine and concrete in their efforts to support former prisoners in being successful on the outside. It’s the lack of resources for support and treatment that Nelson sees as being the largest barrier to her and DOC’s efforts. Right now everyone is doing the best they can with what is available, the equivalent of using floating driftwood to shore up drowning people rather than the needed life-rings, but at least it is something. Nelson is hopeful more resources will become available and that people in Juneau will continue on the path of humanizing people who have suffered from addiction and been incarcerated. During 2016, Nelson’s schedule involved meeting with the United States Surgeon General prior to the release of his landmark report, the first-ever national report, about alcohol, drugs, and health. She got to see much of what she was thinking written down and legitimized by people at the very top of the government in that report. It was a time she will never forget and that also illustrates how far she has come from being a homeless addict on the streets of Ketchikan. would say ‘Hello’ to her and wish her a good day. Nelson says the hate can just bounce off a person who already hates themselves, but being acknowledged and treated kindly, cuts right through the armor. 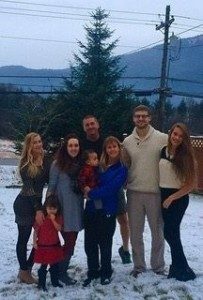 On Thanksgiving Day retired Commissioner of the Department of Public Safety Terry Vrabec posted a family picture. It was similar to holiday pictures posted by millions of people. The Vrabec family photo is different because for many years no one in that family thought Brandi Vrabec, on the far left, would ever be part of a happy family photo again. Brandi’s drug addiction separated her from her family, her values, her confidence, and almost separated her from her life multiple times. Now Brandi has two years and one month in recovery from substance abuse, making the picture you see with this post possible. drug addiction. Facing all that guilt while sober has been a challenge but one Brandi is meeting with the help of her housemates at a transitional home, one for women leaving prison, called Haven House. Brandi came to Juneau as a teenager, when her father became one of the state’s top law enforcement officials. Terry Vrabec talked to JPD about his initial disbelief that a child of his could become a drug addict, after so many opportunities and so much structure. His journey went from disbelief, to trying to help, to refusing to have his only daughter in his home. Terry Vrabec found, to avoid enabling, he even had to refuse to buy groceries for Brandi because she would trade anything for drugs or give resources to her fellow drug users. Brandi was always an intelligent girl, and graduated high school even while using alcohol and other drugs regularly. A rare instinct for self- preservation told her to avoid the prescription painkillers that were readily available when she was in high school. At that time, those pills had no anti-crush chemicals in them and could easily be turned into powder and snorted. Brandi estimated that on leaving Juneau for Washington she knew 40 people using and addicted to prescription painkillers. Brandi did well in Washington for a while. She was in sales and advancing professionally on a fast track. Then she and her boyfriend let a friend from Juneau come and stay with them. That friend was using and dealing prescription painkillers. Brandi developed a habit of using four to five pills a day at $50 per pill. At first, her sales numbers at work went up. She felt confident and capable. Brandi thought no one knew what was going on but she admits now she was fooling herself. Once she started stealing from her employer it did not take long for her to become unemployed and homeless. Brandi and her boyfriend were taken in by her aunt. Brandi stole property from her aunt, items like jewelry purchased by her aunt’s deceased husband. Brandi had moved back to Fairbanks by the time her aunt discovered the level of betrayal. Her aunt was hospitalized over her distress. Brandi’s mother scrambled to find and buy back items but the level of damage done could not be undone. When Brandi got back to Fairbanks she turned 21. She got deep into the party scene and did not stay away from opiates for very long. About the time she first used heroin, she was in a serious car accident. The accident was the other driver’s fault so the incident not only led to long and robust access to prescription painkillers, she also received a settlement of $132,000 dollars. $82,000 and she had a plan for that money. She had been listening to music that glorified drug dealing and watching shows that did the same. Brandi decided to use the money to set herself up in what she thought was the glamorous life of a drug dealer. Brandi got a purse she thought fit the image, she suspects it might have been fur- trimmed with a gold-chain shoulder strap, and put all of her cash into it. She moved to Anchorage and started her business. Brandi soon discovered that the life she envisioned in Anchorage wasn’t happening. The drug-dealing world was not glamorous. It was ugly, violent, and there were no rules. When Brandi would use drugs, her ‘friends’ would rob her once she nodded off. She would call her father and complain someone stole thousands of dollars from her. sympathetic to her complaints about how unethical people were being toward her. When Brandi got to the end of her money she went back to Fairbanks. That was when the felony charges started. Her father, like most law enforcement officers, dreads the middle of the night calls to tell him about a public safety emergency. He learned to dread, even more, calls from or about Brandi. 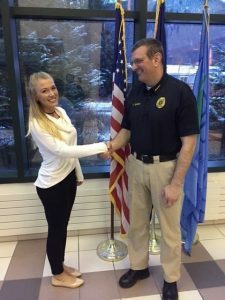 One event that caused an Alaska State Trooper Commander to call Terry Vrabec involved Brandi being high and struggling with a store employee over a jacket she was stealing. The people responsible for the store locked her in. The Troopers, most of whom knew her as a child through her father, responded with a K-9. The dog did not find Brandi because she had crawled into the ceiling. When she fell out of the ceiling she was taken into custody. Terry Vrabec got a call one night to tell him Brandi, who had felony warrants out for her arrest by then, was over-dosing at a home. The person was afraid Brandi was going to die. He persuaded the person to provide the address and sent Troopers to that home. Brandi remembers that when the Troopers arrived her ‘friends’, other drug addicts, shoved her out of the house as fast as they could to get the Troopers to leave. Brandi remembers how mad she was at her Dad then, but now realizes that night, plus over a year in jail, ultimately saved her life and put her on another path. give Haven House a chance. Brandi’s brother, Tommy Vrabec, lives in Juneau and goes to ‘family’ gatherings at Haven House. He is a big supporter and cheerleader for his sister. While Brandi jokes about never living anywhere but Haven House, she is starting to think about her future. Brandi wants to spend the rest of her life in service to others. She is considering something along the lines of Peace Corp or missionary work. Brandi now wants to see the world and help others. She is particularly interested in helping children, possibly teaching. JPD believes Brandi will achieve just that. Brandon Johnson is a man you talk to for just a few minutes before you realize how intelligent, thoughtful, and articulate he is. You have to know him longer to know he went to prison and has had to overcome significant challenges. 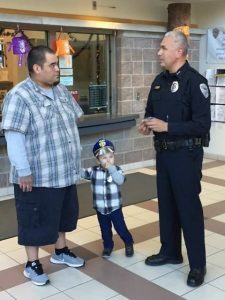 Johnson is the Juneau Police Department’s Re-Entry Hero for October, 2016. As a child in Yakutat, Brandon thought it was normal to have multiple family members abusing alcohol. He thought it was normal to be raised by a grandmother because alcohol caused his mother to be in and out of his life. Brandon started abusing alcohol himself when he was 18. Brandon is clearly a natural leader and he was a youth leader in high school and wanted to go to college. The data required for the forms, like his grandmother’s tax information, was beyond what Brandon could handle gathering on his own. Brandon did not get into college so he entered what he calls his extended adolescence, a period that lasted about ten years. Brandon made good money fishing but he drank it up at the bar. He decided to move to Juneau and got a job here. He continued to spend his money on alcohol and one night, after breaking up with his girlfriend, he got drunk and got into a confrontation with a man with whom he had a history. The result was a felony conviction for Assault in the 3rd degree and a sentence of 36 months with 28 months suspended and four years of probation. When Brandon got out of jail, he did not understand yet that there was something wrong with how he was making decisions. His probation officer did see the problem and when Brandon violated his probation he was offered substance abuse treatment. Brandon graduated treatment and set goals. He has met almost all of those goals and, for a while, seemed to be on the right path. The death of Brandon’s mother derailed his progress. He started drinking again and it was the probation system that caught him, again. He went back to treatment but was not committed to sobriety. Ultimately, Brandon had to go back to prison in order to find the motivation to make a real, lasting change. In prison, Brandon met an inmate who was taking college classes through the ‘Flying University’. Brandon’s dreams of getting a college degree re-surfaced and he started think about a better future for himself. A mentor helped Brandon with his college paperwork including the application. That same mentor also helped Brandon’s wife start college. Now both of the Johnsons are in school and raising a five year old son and a two year old son. Brandon says that support opened up possibilities for Brandon he had not seen before. Brandon says being on probation, out of necessity, closes a person’s world. He could no longer associate freely with former friends and even relatives. His behavior had to be strictly controlled and that was very isolating. The world opened up for Brandon when he embraced an advanced education, and started leading a student group, ‘Wooch een’, a group whose activities are based on native values. Brandon is now planning to go into tribal politics. He wants to encourage other native Alaskans to reach his or her highest potential, no matter how old they are. Brandon points out that he is a 32 year old college sophomore. A profession in politics is not what is most important to Brandon, though his just re-acquired voter registration card is his most prized possession. His priority is that his childhood normal not be what his children experience. His highest priority is that his sons have two educated parents in a sober home that they own. JPD has no doubt that situation is exactly what Brandon and his wife will achieve. Brandon Johnson’s young son helped his Dad accept a JPD challenge coin from Deputy Chief Ed Mercer.